The entry pattern indicator is designed to help traders spot trade entry opportunities on RangeBar charts, which are key for profitable trading on these kind of price action charts. Optional sound alerts (and custom sound files) are included with the indicator. They will alert the trader whenever a specific price action pattern starts forming, so traders will have plenty of time for chart analysis, target location and a precisely timed entry. Two types of patterns are recognized by the indicator and these are the 4 bar reversal pattern and the rectangle consolidation breakout pattern. Both work great on range bar charts for any liquid market. The pattern is indicated by a diamond symbol placed just above the swing high or low and a “cross-hair” icon indicating the possible trade entry point.This sort of pattern is traded by placing en entry trade at the location indicated by the cross-hair symbol and placing a protective stop one pip above the swing high or low (depending on the indicated trade direction). The trades should typically be taken in the direction of the trend on the longer time frame. for higher probability trades. The pattern is indicated by horizontal arrows placed above and below the detected range bar consolidation pattern, thus indicating possible breakout levels. This patter should be traded in the direction of the current trend for high probability breakout trades. Depending on the range bar size used, the protective stop can be placed just below the low of the breakout candle or just above the high of the breakout candle, depending on the trade direction. maxRectangleHight – The maximum hight of the consolidation pattern to be indicated. The trader can limit the hight of the signaled pattern by entering the maximum number of ticks from high to low, which a pattern can have at most to be considered valid. The default setting of “0” turns the hight checking feature OFF, thus all consolidation patterns will be displayed. showRectanglePatterns – Parameter indicating, whether to show rectangle consolidation patterns on the chart. showReversalPatterns – Parameter indicating, whether to show 4 bar reversal patterns on the chart. 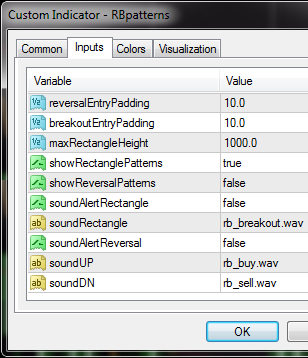 soundAlertRectangle & soundAlertReversal – Parameters that indicate, if the indicator should sound an alert, when a certain pattern detected on the chart. soundRectangle – The name of the WAV file used for sound alerts upon detection of rectangle consolidation patterns. soundUp & soundDN – The names of WAV files used for sound alerts upon detection of reversal patterns. (One file for an upward reversal and one file for a downward reversal type). 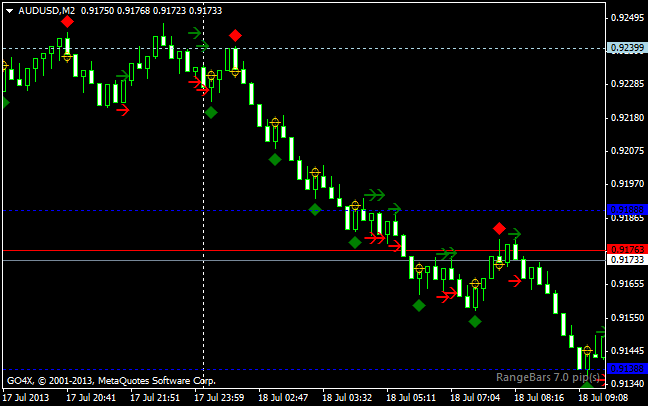 This is a very simple scalping approach, which can be further optimized using various trend and currency strength indicators, so that you are only buying the strongest currencies and selling the weakest ones.